Ampera bridge is a bridge in Palembang, South Sumatra Province, Indonesia. 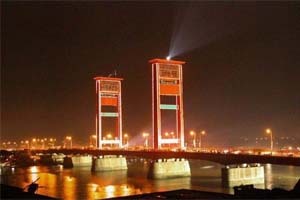 Ampera bridge, which has become a kind of symbol of the city, situated in the middle of the city of Palembang, linking regions and Seberang Ulu Seberang Ilir separated by the River Musi. Initially, the center of the body of this bridge can be lifted upwards so that the mast passing underneath the bridge body is not stuck. The middle of the bridge can be removed with mechanical equipment, two each pendulum weights about 500 tons in two towers. The speed of his appointment about 10 meters per minute with a total time required to fully lift the bridge for 30 minutes. At the center of the bridge is removed, the vessel with a width of 60 meters and with a maximum height of 44.50 meters, can pass the River Musi. When the center of the bridge is not raised, the maximum height that the vessel can pass under the bridge Ampera only nine meters from the surface of the river water. Since 1970, the activities go up and down the middle of this bridge is not done anymore. The reason, the time used to lift the bridge is considered to disrupt the flow of traffic on it. In 1990, the second pendulum weights on the bridge tower is lowered to avoid a second collapse inil ballast load.